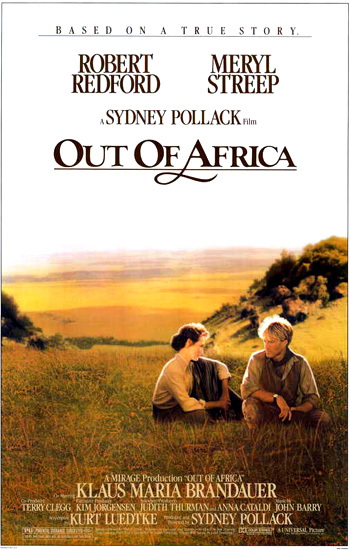 Sydney Pollack's grandly-spectacular, handsome romance spanning two decades, Out of Africa, was based by Kurt Luedtke on the life, works, and memoirs of Karen Blixen (a Danish writer who published under the name Isak Dinesen). The romantic biopic had eleven Oscar nominations and captured all the major awards, seven in all - except in the acting categories (Best Picture, Best Director (Sydney Pollack), Best Screenplay Adaptation (Kurt Luedtke), Best Cinematography (David Watkins), Best Art/Set Direction, Best Sound, and Best Original Score). 79 year-old director John Huston's 40th film, the dark comedy about the Mafia, Prizzi's Honor (with eight nominations and one win - Best Supporting Actress). All ten of the Best Actor/Actress nominees were American-born - the first time in Oscar history. 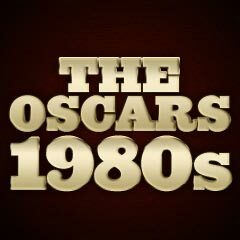 In this year, it was also the second time in Academy history (the first was in 1972) that three of the Best Actor and Best Actress nominees in 1985 were black performers: Whoopi Goldberg as Best Actress for The Color Purple, and Margaret Avery and Oprah Winfrey as Best Supporting Actress for The Color Purple. But all of them lost in their categories. All of the nominees in the Best Supporting Actor and Actress categories were first-time nominees. The remaining two Best Supporting Actress nominees were Amy Madigan as Gene Hackman's daughter caught by her father's mid-life crisis in Bud Yorkin's Twice in a Lifetime (the film's sole nomination), and Meg Tilly as the childlike, beatific Sister Agnes in Agnes of God. The Honorary Oscar honoree was Paul Newman, "in recognition of his many and memorable compelling screen performances and for his personal integrity and dedication to his craft." From 1958 to 1982, he had been nominated six times for Best Actor - and failed each time. Newman's directorial effort for Rachel, Rachel (1968) also earned four nominations (including Best Picture). He would only have to wait one more year to win his first Best Actor Oscar for The Color of Money (1986). The unsafe, inventively-futuristic film from Terry Gilliam - Brazil (although nominated and unsuccessful for Best Original Screenplay and Best Art Direction/Set Decoration awards) was missing from the nominations for Best Director and Best Picture (although the Los Angeles Film Critics Society awarded it those two distinctions). And writer/director Lawrence Kasdan's unique western Silverado, Nicolas Roeg's Insignificance, and writer/director/star Albert Brooks' Lost in America were conspicuously absent from major nomination categories. The Best Visual Effects Oscar award was won by Cocoon, but director Barry Levinson's nominated Young Sherlock Holmes should have won instead for its startling and superb CGI SFX - its sole nomination. The anthem Don't You (Forget About Me) by Simple Minds from The Breakfast Club was un-nominated for Best Original Song, as was writer/director John Hughes. Akira Kurosawa's Ran (although it had four nominations and one win as noted above for Costume Design) was not nominated for Best Picture, Best Score, Best Film Editing, Best Adapted Screenplay, or Best Actor/Actress (for Tatsuya Nakadai as Lord Hidetora Ichimonji, or Mieko Harada as ruthless widowed warrior Lady Kaede). In director/writer Woody Allen's comedy-fantasy The Purple Rose of Cairo (with only one nomination, Best Original Screenplay), a take-off on Buster Keaton's Sherlock, Jr. (1924), Mia Farrow was overlooked as unfulfilled waitress/dishwasher Cecilia, as was Jeff Daniels in a dual role as (1) the main fictional character of "The Purple Rose of Cairo" - a dashing explorer/archaeologist named "Tom Baxter", and as (2) Gil Shepherd - the real-life actor who played Tom on the screen.